In Eight World Cups, New York Times sportswriter George Vecsey reflects upon over twenty years of covering soccer's biggest event. Vecsey has spent over four decades writing for The Grey Lady and wrote the "Sports of the Times" column from 1982 through 2011, which largely focused on the broader off-field impacts and aspects of athletics. His new book offers a very personal account of covering the World Cup and his experiences following legendary teams and players such as Diego Maradona and Socrates. It is an intelligently-written recent history of the World Cup and while it is likely to tread upon some familiar territory for most readers, it is still a worthwhile pickup for soccer fans and those interested in the international phenomenon of the event. Eight World Cups is largely structured chronologically with Vecsey describing highlights from the 1982 World Cup onwards. The book is largely a personal recounting of Vecsey's experiences at various World Cups rather than a broad overview of the events. Due to some fundamental laws of physics, he wasn't able to be at every game and he had to be selective in what games he attended. I found this "limitation" to help prevent the book from becoming a collection of basic summaries of each World Cup. He often becomes attached to certain teams and cities and tries to catch as many of their games as possible. Additionally, he generally chooses well (i.e. interesting/good teams with interesting/good players) and its not like the reader is ever mired in absurdly detailed descriptions of the rather inept Greece team in 1994 or something. Vecsey shares personal encounters with English hooligans and other fans, interviews with players and referees and anecdotes about the culture and quirks of the hosting countries. He strikes a very nice balance between describing the games themselves as well as off-field issues such as refereeing, the treatment of players, and the murky internal politics of FIFA. Writing for an American newspaper, Vecsey pays a good bit of attention to the American squads as well. He also weaves the history of the U.S. National Men's and Women's teams between the World Cup chapters and their remarkable evolution since he started covering the sport. Vecsey is a gifted writer who describes the matches with lyrical and detailed prose that showcases his knowledge and passion for the sport. 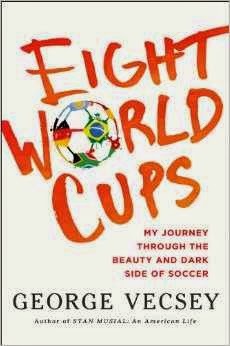 I especially enjoyed the chapters on the earlier World Cups that I was much less familiar with. His recollections of more recent events contained fewer new insights as they covered events I was already pretty familiar due to the humongous amount of press coverage and scrutiny garnered by the World Cup. I still enjoyed these portions, just not as much as those that preceded them. A recommended read for soccer fans looking for a fun read with some intellectual heft. Die-hard soccer fans well-versed in the history of the sport may not find that many new insights, but casual fans and those just interested in the spectacle of the World Cup should pick up Eight World Cups.